This lamp is made of unusual paper, it is only one of a kind, nobody else will have the same one because each bunch of paper is totally special. The lampshade is made of recycling carton in natural, brown carton color. The paper is about 5 millimeters thick (1/4 inch) – solid and not transparent. It’s 32 cm (13 inches) wide and 28 cm (11 inches) high without the top cup. The lamp looks the best hanging low – to give light on the desk or table and not to dazzle. It can be painted with all kind of paint, decorated with decoupage style, or cut. You can pin things into it easily – unusual pinboard. It’s safe and tested by me almost 10 years now. I recommend using energy saving bulbs or led bulbs, but traditional is 60W max. The lamp is ready to mount, contain bulb holder, 1.5 m (60 inches) wire, plastic details, masking ceiling cup. VERY, VERY lightweight – only 1,5 kg (about 3,4 pound)! It matters when it is your head… The lamp is the best fit as a secondary, or direct space. Save a place on the desk – hang your lamp, or few of those. 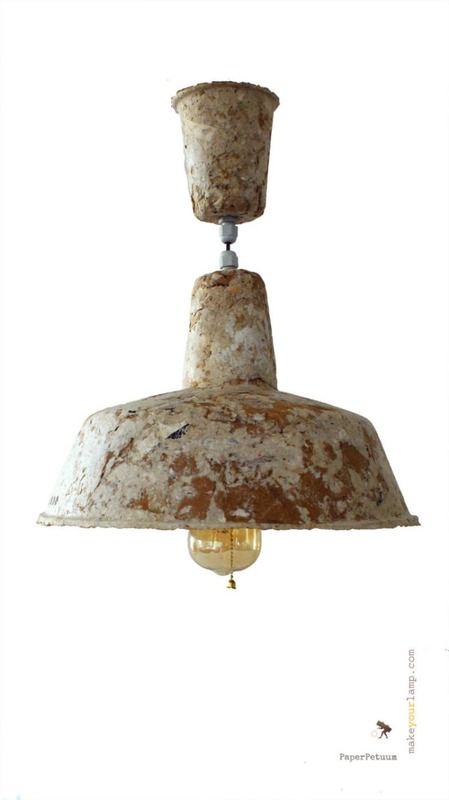 Looks great in industrial style interiors, but it is modernized – made eco. Imagine, how much heat it needs to produce plastic, glass or metal product, and pollution, and weight transportation… Modern Lamp is completely natural. Paper doesn’t electrify dust like plastics, so the cleaning process is just hoovering from time to time. The lamp is fully recyclable – just remove the cables, use them with a new lamp, and recycle shade in the paper bin. It is made by hands, in the USA with natural sources of energy – sun, wind and human forces.